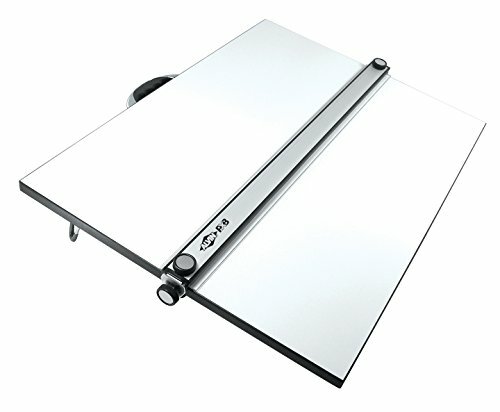 Alvin PXB36 PXB Series Portable Parallel Straightedge Board 24" x 36"
Professional-quality portable 24 inches x 36 inches drawing and drafting board with built-in parallel straightedge for all kinds of creative and technical applications. Perfect for students and those who need an accurate drawing surface but don't have the space for a full-size drafting table. Fully assembled! Aluminum straightedge with soft, rubber edges for enhanced grip, comfort and control. Straightedge glides smoothly up and down the board while the cross-wire and pulley system underneath keeps it parallel in any position. Crystal clear acrylic blade is 0.12 inches thick and includes inking edges underneath to minimize smudging. Blade clearance is 3/16 inches for use with foam board, cutting mats, and more. Straightedge has brake mechanisms on each end for secure, positive locking in any location on the board. Large brake knobs include rubber grips for comfort. Straightedge has top-mounted adjustment knobs on each end for fine-tuning parallelism. Especially useful when reinserting a drawing on the board for additional work. Smooth, white Melamine surface for bump-free drawing. Particle board substrate is 0.63 inches thick for strength and durability. Folding metal legs are set at an angle to prevent accidental collapse and include rubber-dipped ends to prevent scratching. PXB36 has 5 inches legs. Boards can be used in the elevated or flat position. Rubber grip tracks underneath allow front of board to overhang a table edge up to 8 inches . This increases the working angle and brings the drawing surface closer to the user. Compact, folding design for convenient transportation and storage. No assembly required. Ready to use. Drawing board is CARB compliant and all components are phthalate and lead-free. Brake mechanisms on each end. 16 inches x 21 inches. Brand: Alvin | Manufacturer: Alvin & Company, Inc. 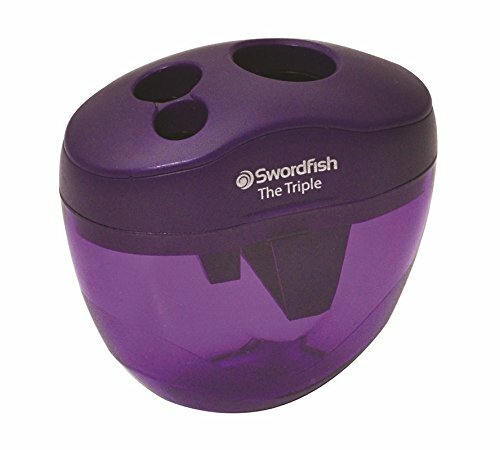 The Swordfish Twin Combo has a soft rubber edge for comfortable grip; it is a canister product with one end being a double hole sharpener for 8mm & 10.5mm diameter pencils and the other end for an eraser. 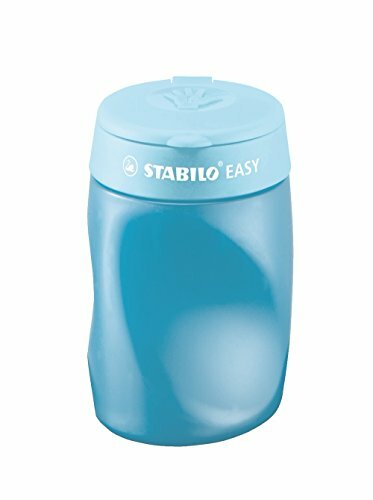 The Sharpener has a tamper resistant screw and inset blade so no sharp edges are accessible, there is also a lid to keep the pencil shavings clean & tidy. The Eraser is non-toxic, latex-free, Phthalate and PVC-free and has a lid that keeps the eraser clean throughout use. 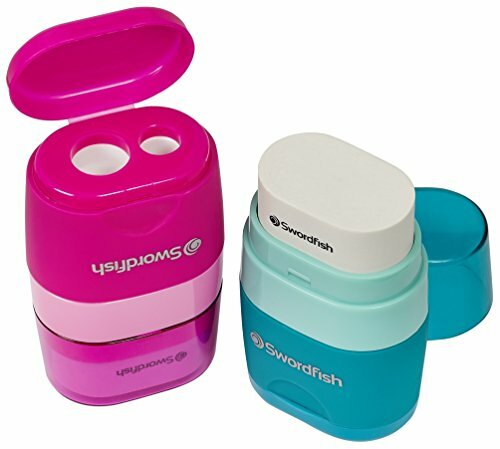 The Swordfish 'Combo' Pencil Sharpener and Eraser is available in 4 stunning colours - 5x Black, 5x Blue, 5x Pink and 5x Turquoise in a pre-packed box of 20. M + R pencil sharpener 0981 0090, crank pencil sharpener for pencils and coloured pencils with a diameter from 8 mm - 11.5 mm. Quality cutter, transparent chip container, rubberised claws to protect the pins, auto-stop when pen sharpened, long cone for pencils, short cone for coloured pencils adjustable, table attachment. 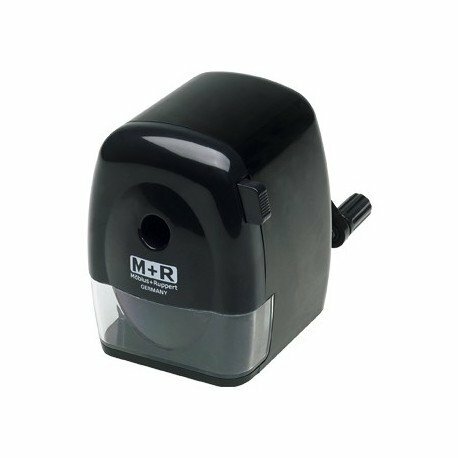 M + R pencil sharpener 09810090 (black). -Mobius Ruppert M + R 09810090. 3 in 1 left handed sharpener for use with the STABILO EASYcolours, STABILO EASYgraph, STABILO EASYergo 3.15 and all thin wooden pencils. The Swordfish Blinc Blinc, black zinc sharpener has a double hole for 8mm and 10.5mm diameter pencils. It has a strong metal casing, has tamper resistant screws and inset blades so no sharp edges are accessible. Ideal for school, college and university students. With a robust metal body and strong extendable front plate, this manual pencil sharpener is apt for high volume usage in busy offices and schools. The large aperture allows both standard 8 mm and larger 12 mm diameter pencils to be sharpened quickly and efficiently. 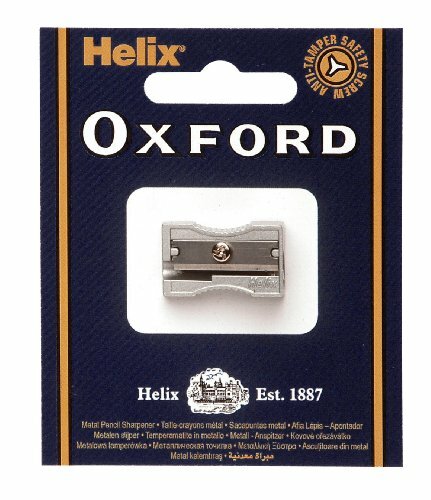 This sharpener can produce a varying range of pencil points, from the engineer preparing a detailed drawing requiring a fine hard point to the artist working with soft pencils and crayon, needing a gently rounded point. Simply turn the pencil point adjuster to select the pencil point finish required. The most important part of a pencil sharpener is the blade. Engineered from the high quality steel, the lasting helical blade ensures precision sharpening in seconds. Replacement blades are available, ensuring many years of use. The sharpener automatically stops sharpening when the pencil tip is sharp, minimising wastage caused by unnecessary sharpening. The transparent shavings tray makes it easy to see when the tray requires emptying and for added stability, a desk clamp is included to allow the sharpener to be fixed to a table or desktop. 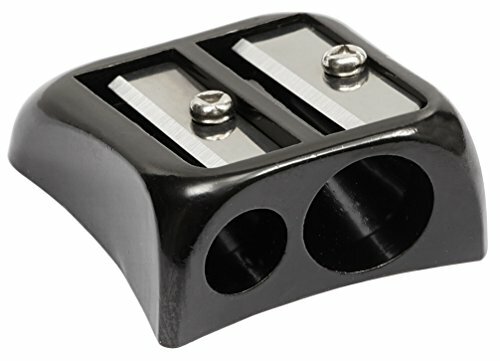 The desk clamp is apt for a classroom environment as it ensures the sharpener is kept safely and securely in one place. Faber-Castell's Sand Paper Block is a high quality sharpener, the blade especially is ideal for optimum sharpening of wood-clad pencils. Due to their robust and hard leads, graphite pencils can be sharpened to a very thin point and given their softer leads, coloured pencils are sharpened to a shorter and blunter point. 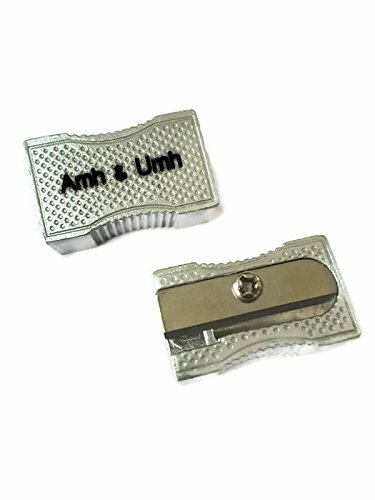 For optimum sharpening, we recommend replacing the sharpener now and then because the sharpener blade will become blunt over time. This results in more tip breakages. Faber-Castell is one of the world's largest and oldest manufacturers of pens, pencils, other office supplies and art supplies, as well as high-end writing instruments and luxury leather goods. Headquartered in Stein, Germany, it operates 14 factories and 20 sales units throughout the globe. The Faber-Castell Group employs a staff of approximately 7,000 and does business in more than 100 countries. The House of Faber-Castell is the family which founded and continues to exercise leadership within the corporation. 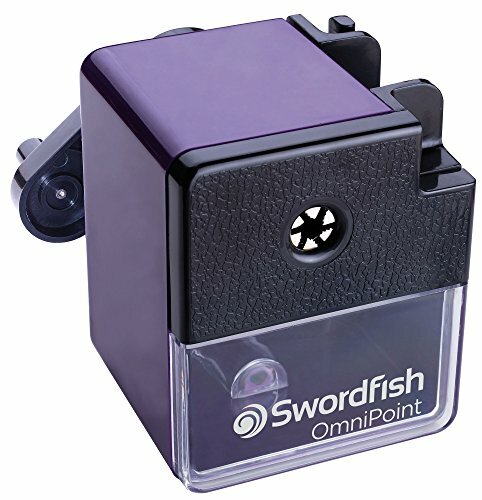 The Swordfish Twin soft grip sharpener has soft rubber edges for a comfortable grip and a double hole for 8mm and 10.5mm diameter pencils. 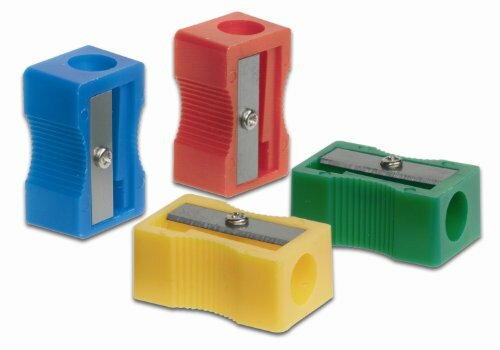 Each Sharpener has tamper resistant screws and inset blades so no sharp edges are accessible - a great safety feature, so perfect for children. 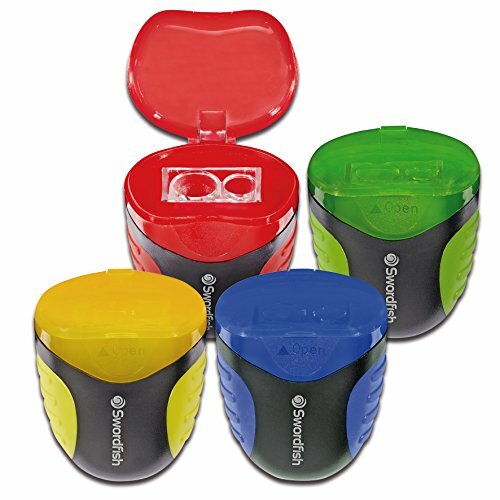 Available in a Pack of 1 - Colour choice will vary and you will receive either a Blue, Green, Red or Yellow Sharpener. 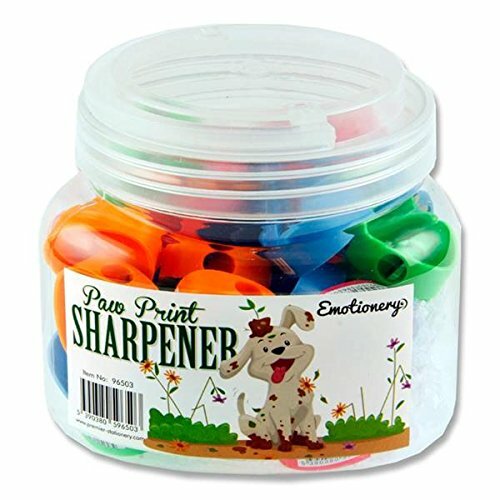 Premier Stationery Emotionery Paw Print Pencil Sharpener, Tub of 50, 4 Assorted Colours, Green, Orange, Blue & Pink. Single Hole. Supplied in a plastic carry handled tub. Another Quality Product from Premier Stationery. The STABILO EASYsharpener left handed is a 3 in 1 sharpener for use with the STABILO EASYcolours, STABILO EASYgraph, STABILO EASYergo 3.15 and all thin wooden pencils. The sharpener fits perfectly in your pencil case and is always a help when your pencils get dull. 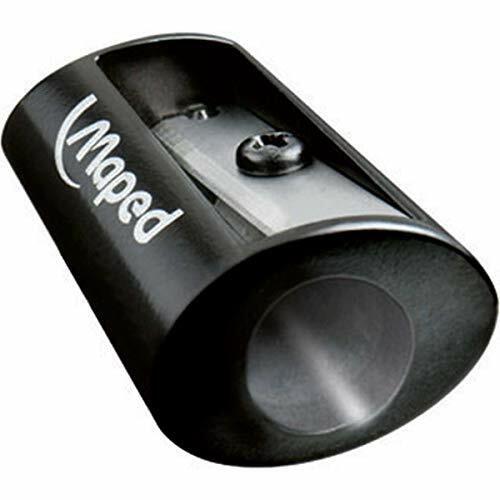 The sharpener is made for 3 different lead diameters. It is perfect for sharpening STABILO EASYcolors, STABILO EASYgraph, STABILO EASYergo 3.15 and all thin wooden pencils. In order to not lose your sharpener you are able to write your name on the space for the name tag. Take advantage of the moulded grip for optimal hold. 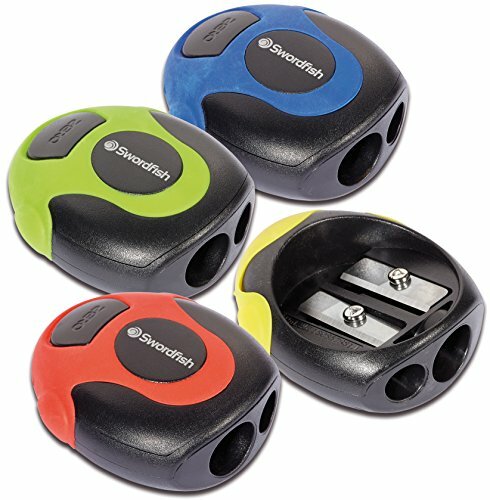 You can get the sharpener in different colour versions for left handers. The Swordfish Canister Flip has a soft rubber edge for comfortable grip; it is a canister product which holds more pencil shavings and has a double hole for 8mm & 10.5mm diameter pencils. The Sharpener has tamper resistant screws and an inset blade so no sharp edges are accessible, there is also a lid to keep the pencil shavings clean & tidy. 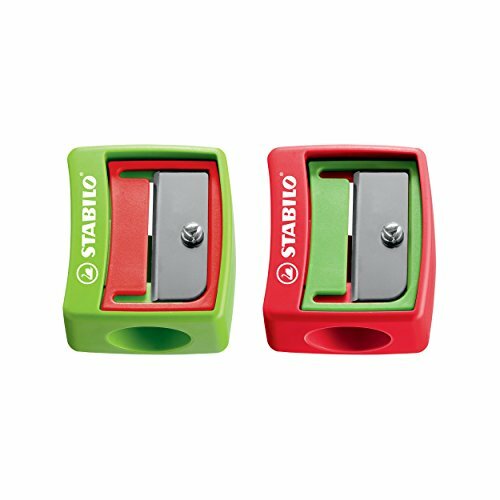 Sharpener easy to use small rectangular. Aluminum frame with a single hole for - sized scale. Both grooves are easy to use. Use a pencil to touch the rotating blade and a sharp pencil sharpener until needed. 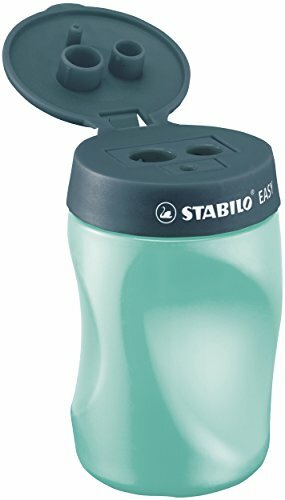 The STABILO EASYsharpener right handed is a 3 in 1 sharpener for use with the STABILO EASYcolours, STABILO EASYgraph, STABILO EASYergo 3.15 and all thin wooden pencils. The sharpener fits perfectly in your pencil case and is always a help when your pencils get dull. You can get the sharpener in different colour versions for right handers.